Thank you Mr Rowson for your re-interpretation of a French Old Master to comment on one of today’s talking points in the news. 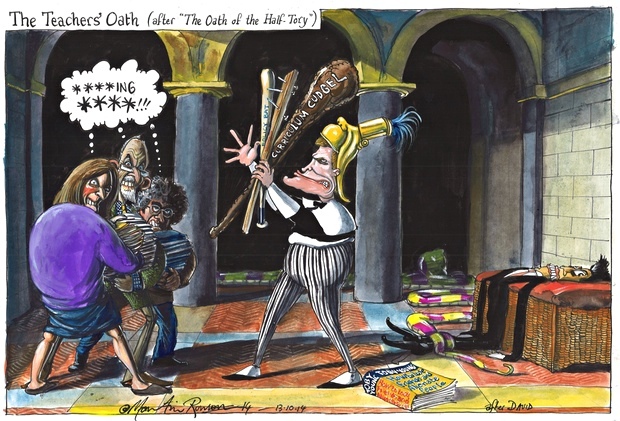 Martin Rowson’s biting political cartoons always have a wealth of detail both visual and referential. 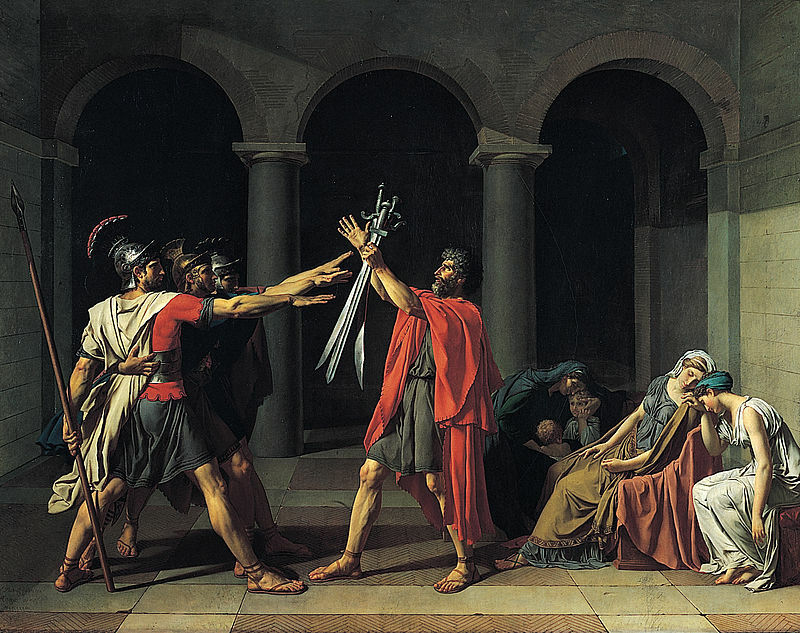 Today’s offering uses Jacques-Louis David’s Oath of Horatii to comment on Labour’s Shadow Education Secretary, Tristram Hunt’s public pronouncement that teachers should take a public oath committing themselves to the values of their profession. Monday 13 September 2014. The Guardian – Martin Rowson/Jacques-Louis David. First a simplistic explanation of the symbolic meaning of the painting. It depicts the Roman Horatius family, who had been chosen for a ritual duel against members of a family from Alba Longa, in order to settle disputes between the Romans and the latter city. The painting shows the three brothers on the left and the Horatii father in the centre. The Horatii brothers are depicted swearing upon (saluting) their swords as they take their oath. On the right, three familial women are weeping. The mother and sisters are shown melting into expressions of sorrow. Jacques-Louis David, 1784 – Oil on Canvas, 129.8 cm × 167.2 cm, Louvre, Paris. Now my person interpretation of Martin Rowson’s reworking of the subject matter. My own interpretation because an interpretation can only be the act of explaining, reframing or making comprehensible something by showing your own understanding and by bringing personal experiences, insights and knowledge to the subject. And Rowson always tests the viewer with a multitude of referential pointers and comments. Let’s start with the title. Here we have the word oath being used ambiguously. Can it mean, as Tristram Hunt would have, a solemn promise regarding one’s future action or behaviour or, as the teachers are probably thinking (and shown in the think-bubble in the body of the cartoon) a profane or offensive expression used to express anger or other strong emotions ? The profanity in the think-bubble is another multi-referential device. If refers back to the second part of the title ‘Oath of the Half-Tory’, a play on words with Horatii, and the fact that Tristram Hunt is often ribbed about being in the Labour Party. He is percieved as coming from a very privileged background (his father is Baron Hunt of Chesterton, he is a Cambridge Graduate, he is cousin to Virginia Bottomly and he has the name Tristram). The teachers are using the phrase that David Cameron used to describe his own Conservative administration – “Effing Tories” whilst out campaigning. Hunt is also depicted in the pantomime ‘posh-boy’ regalia that George Osborne is often rendered in. The inference – is Hunt Tory-Lite? There is much more to see in this cartoon. The teachers can’t salute because they can’t raise their arms due to the burden of marking and other work they are carrying. The Curriculum Cudgel and a Policy Bat instead of well honed swords for the fight. A well thumbed copy of the Evangelist for Free Schools (a misnomer if there ever was one) Toby Young’s How to Lose Friends and Alienate People lies on the floor next to Hunt. A deflated Miliband lies seemingly squeezed by that snake Farage after the Heywood and Middleton bye-election. And do I see a resemblance to a former Secretary of State for Education in what I will call a Govian helmet? Maybe. Anyway a well rendered political comment referencing back to an historical painting. At the time revolution in France was looming, paintings urging loyalty to the state were numerous and the Oath of the Horatii became one of the defining images of the time. This entry was posted in Referential Cartoons and tagged Jacques-Louis David, Martin Rowson, political cartoons, Tristram Hunt on October 13, 2014 by Chris Walker. I’d like to share my love of art-referential political cartoons. I find that the political cartoon can be far more scathing of our “leaders” than some of the shoddy text-based journalism that we are currently experiencing in the mainstream media. The cartoons that reference fine art are, I find, particularly clever and satisfying and with the current crop of cartoonists that we are lucky to see today (Steve Bell, Martin Rowson, Dave Brown, Chris Riddell et al.) have the power to cut through the fog of political spin with this particular brand of editorial comment. When I have archived previous cartoons I found that I sometimes needed to precis the news article that it was referencing. Now I do this all the time. 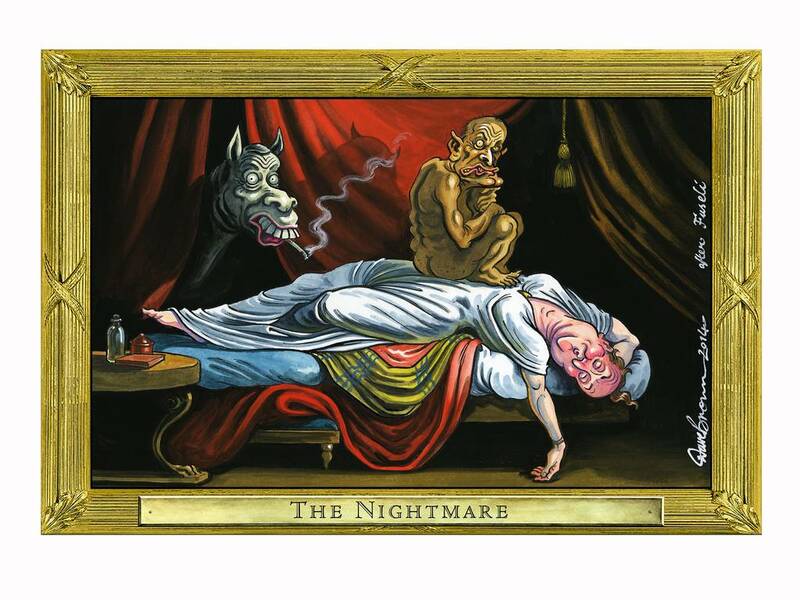 So today I post Dave Brown’s re-intereptation of Henry Fusili’s “The Nightmare” with an overview of the story it represents. P.S. Brown often uses the Saturday edition of the Independent to ‘Misuse Masterpieces’ in his ‘Rogue’s Gallery’. Saturday 30 August 2014. The Independent – Dave Brown/Henry Fusili. Problems for Cameron as vocal backbencher, Douglas Carswell, defects from the Tory Party to UKIP, forcing an ill-timed by-election in Clacton. 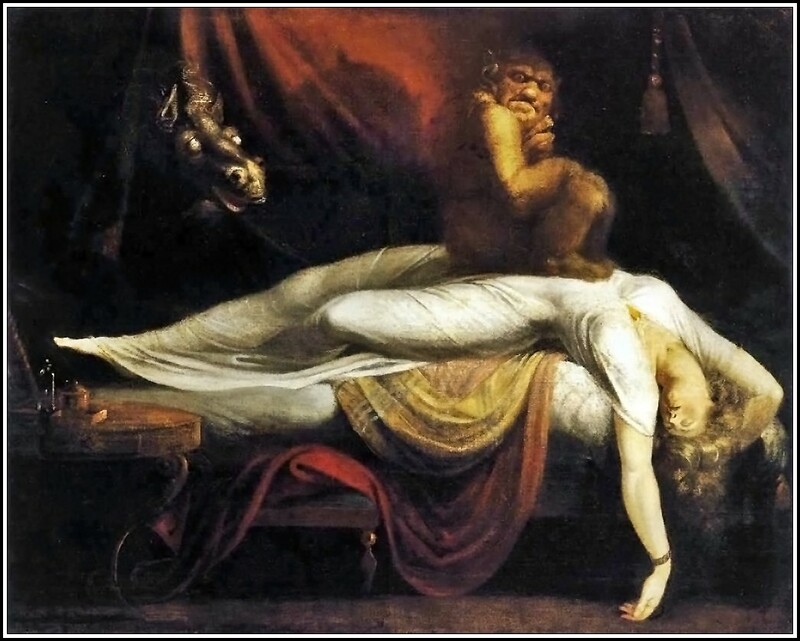 Carswell is depicted as the incubus sat on Cameron’s chest whilst a cigarette-smoking, UKIP leader Nigel Farage (as the horse’s head) looks on. This entry was posted in Referential Cartoons and tagged Dave Brown, Henry Fusili, political cartoons on August 30, 2014 by Chris Walker.